Are you someone who is disrupting and shaping the future? Could you make a difference with USD 25 000? 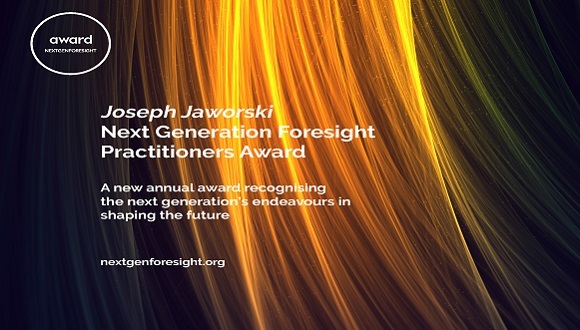 The Joseph Jaworski Next Generation Foresight Practitioners Award is now open! This is an annual award established by the School of International Futures recognising the next generation’s endeavours in shaping the future. Apply by 31 May 2019 for a chance to win the main award of $25000 and over ten different Special Awards. Next Generation foresight practitioners between 18 and 35 years old (at the time of entry) or have fewer than ten years’ experience working in strategic foresight. The world is changing and as it does we need new sources of inspiration and innovation. Change will come from many arenas and peoples. We believe that the practice of foresight can help us embrace change, uncertainty & create better futures. The Joseph Jaworski Next Generation Foresight Practitioners Award aims to identify these innovators and support them in their endeavours. The Main Award includes a years’ incubator funding worth USD 25,000 to support a new foresight initiative, mentoring and support for the winner, as well a free ticket to our SOIF2018 retreat. Special Awardees (in social enterprise, urban policy, environmental humanitarian and geographical sectors, with more special awards being added soon) will also benefit from support to develop personally and professionally and all qualifying entrants will have opportunities to showcase their work and be invited to join the global “Sensing Network” community. To help maximise your chances of success, we are holding a series of webinars to support you through the application process, answer questions and provide you with an opportunity to speak to the NGFP2018 winner and judge. For more information on the awards visit nextgenforesight.org. John Schroeter--publisher at Technica Curiosa--is organising a book marking the 50th anniversary of Future Shock (see the full explanation below). He already has some distinguished contributors (including Alan Kay and the astronomer Martin Rees as well as our own Andy Hines, Richard Slaughter, and Clem Bezold) but would like to extend the range of diversity and voices. He's looking for contributions of 750 words to 2,000 words, with a delivery of manuscript in late April. The brief is to reflect on an aspect of Alvin Toffler's book and then pivot towards your own personal perspective on the future, though the lens of your take on the book. Jay has asked me to co-ordinate a response; I'm going to suggest that if you're interested in getting involved, you can share with me a 75-90 word summary of what you're thinking of saying, and I'll package those up and share them with John. He can then decide what is saying something different from the contributions he already has. The deadline for those 75-90 word synopses is Saturday 16th February. Looking at the line-up so far, it might be characterised as being mostly men of a certain age and colour, perhaps in keeping with the period when the book was published. If you work with younger or more diverse groups of futurists, or people who might have a distinctive perspective on Toffler's book, please share this with them. We would be honored and delighted if your network of professional futurists would like to contribute short essays to the book. Briefly, this would involve reflections on the classic text (any aspect they might choose), and then segue to the authors’ particular views of the future—through the lenses of their work and ideas. The essays will be on the order of 750 to 2,000 words, depending on what is needed to adequately address the subject matter. At the end of essays, we will include their bio and significant links. We look forward to the possibility of working with you on what I know will be an exciting and rewarding project. To offer insights into what progress humans have made, what needs we will have and what human services will be in the United States in 2035 , leading national human services organizations are offering a three-part webinar series to help public and private human services providers and community partners respond to and prepare for major uncertainties in the state of the economy and employment, technology, policy, equity and inclusion. The Institute for Alternative Futures (IAF), funded by the Kresge Foundation, developed the Human Progress and Human Services 2035 project, which considered alternate futures for the nation and with eight state and local areas. Now, IAF and Kresge are partnering with American Public Human Services Association (APHSA) and the Alliance for Strong Families and Communities to expand the reach and use of these scenarios through this webinar series. Hear from users of Human Services 2035 Scenarios as they describe their experience and insights; how the effort related to their planning and decision making; key learning; and results from the effort. Presenters will share their perspectives from the city, county and state level. During the third Webinar, we will “step into” the futures of human services and human progress in the year 2035, exploring the four national scenarios. This session will train participants to think like a futurist and to use the scenarios in their organization or community to enhance their strategic planning, review their vision, and better create their preferred future. NOTE: Each of the three webinars will include time for questions and answers, as well as discussion. Anticipation 2019 is a unique, radically interdisciplinary forum for exploring how ideas of the future inform action in the present. It brings together researchers, policy makers, scholars and practitioners to push forward thinking on issues ranging from modelling, temporality and the present to the design, ethics and power of the future. This conference includes attention to design amongst other domains.